Aficionados of Grand Central Oyster Bar may have noticed that for several years now a Virginia oyster called Sewansecott has been a staple on the menu. It’s actually one of executive chef Sandy Ingber’s favorites. Last week I finally got to try some, and I can see why: They were the best Virginia oysters I’ve found, big and full-flavored, with a big hit of umami and a nice lingering touch of sweetness to balance the Atlantean brine (which is undoubtedly the attraction for Sandy, who is a bit of a brine hound). The only knock against them was the shells, which had a tendency to break during shucking (probably because they are cage grown, and because they grow to market size in just a year–a testament to the richness of the waters). Sewansecotts are grown in Hog Island Bay (not to be confused with the California Hog Island oysters, or the Maine Hog Island; apparently pigs got around once the sailors dumped them), which is on the Atlantic side of the Eastern Shore, an area so pure that it has been designated a United Nations Biosphere Reserve. Certainly a nice thing to think about as you down your second or third dozen. Look for them at GCOB and many other East Coast saloons. Man, these Sewansecotts are some of the best oysters around. I’ve they’re so fully balanced. Though I have noticed that, when shucking, the top shell does break. What can be done to prevent this? Also, have you tried the Chincoteague oysters? If I can recommend any oyster, it would be the wild ones from this region. So salty, yet sweet. Idk man. They’re the best around. Other than your Sewansecotts. Thanks y’all. My 4 year old daughter and I equally polished off a dozen Sewansecotts (and a 1/2 dozen pungoteagues) today on our back porch. 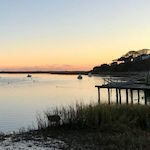 I have to tell you….having grown up culling Connecticut Blue Points, I have a bit of an “attitude” toward southern oysters. Not today! Sewansecotts are fabulous and this seems to be a very good year. Crews like you and the Rappahanock Oyster folks are bringing prominence back to the Bay area. Thank you. Yes, Sewansecotts and some others from down south are changing the whole story. Kudos to your daughter! A gastronaut in the making!